Early Mustang Enduro fuel cell replacement bladder with foam baffling, nut ring and gaskets. Available in 16 gallon and 22 gallon configurations. 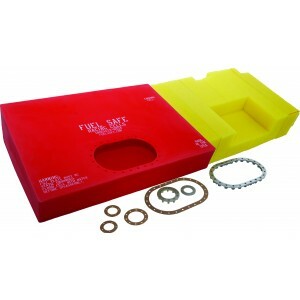 Fits standard and remote fill applications. Our Enduro Cell® line of racing fuel cells offers full FIA-FT3 approval at an affordable price. Built from high strength molded “rubber” components, the Enduro Cell® is a favorite with off road racers and circle track teams. Designed for use with all hydrocarbon fuels and E85 blend and alcohol (alcohol use requires the removal of foam baffling), the Enduro Cell® line of fuel cells from Fuel Safe® delivers excellent performance at a great price. The 16 Gallon Replacement Bladder fits in a 21.5 inch (length) x 30 inch (width at base) x 8 inch (full assembly height) can (approximate dimensions, excluding flange). The 22 Gallon Replacement Bladder fits in a 21.5 inch (length) x 30 inch (width at base) x 11 inch (full assembly height) can (approximate dimensions, excluding can's flange).